It is pointless. Even the Xbox One S version in that video looks better than the Original PC version. If you're going to try to prove your point at least do it apple vs apple and not apple vs oranges. What are arguing about here? Cerny said 8TF is the minimum needed for 4k gaming, based on the One X performance an extra 2TF does seem believably needed for all games to be native 4k. He seems to be spot on. IDK but it is quite funny people think he's wrong. Even a 1080 GTX struggles to maintain 4k 60fps ultra settings in The Witcher 3. Hardly Digital Foundry that video, very vague when it comes to settings. Anyway here's DF latest Burnout Paradise Remaster 4k 60fps, 580 drops quite often and so does 1060 when Xbox stays solid 60fps. However there is a certain area on the X drops to 50 fps when their is nothing going on, probably a bug as its solid 60fps when their is crashes etc. The PC version is coming out LATER this year, that's why that comparison is pointless. Huh, Didn't leadbetter say he tested the PC version on EA access? Are you saying the PC version is not coming out on the 16th? Still worth posting and i don't think Xbox is more powerful than 1060 but sometimes its better sometimes not. In November 2020, that's almost 2021, Next Gen Arch or perhaps Navi 7nm+ will be available, so PS5 will be decked with Next Gen, which may very well be Navi 7nm+ for all we know......either way it's looking likely that PS5 will have Navi. Next year will be full of exclusive games. I think SONY has no need to announce a new console before 2020. From 2020, SONY could announce a new console with 100% solid architecture. What are your predictions? How many Tflops? What date of announcement and launch? CPU? Memory? You haven't listened to it. I'll give you a clue. The remastered version is also on PC. [4K] Burnout Paradise Remastered: Xbox One X/Xbox One vs Original PC - Not Just A Port! Read the title. And yes I know it's also coming to PC...LATER this year. Well the video around 8.30 Richard says what does it take to run this game at 4k 60fps and i took that as the remastered version. thats all. As a technical comparison video it's not very good. i thought Richard had the remastered version on PC ( not the Pc version they were showing). Around 8.20 in video. My mistake i hold my hands up. Consider this your one and only warning overall, and you can no longer post in the thread. Ok, I still loving you forever! You are amazing and hot. Can we ban thastword, he posts in everythread extraordinarily often, long posts that are simply wrong. I suppose it makes sence in this era of Trump being the president of bs but honestly people are leaving this place in droves because of this deliberate debate derailing. Ive proven time and time again his claims are wrong and so he leaves the thread only to come back later when he hopes people wont remember. GTS miles ahead of forza 7? Xbox one x not running games at 4k60 ? Benchmarks that disprove him over and over again? Is he a mod or something i dont understand why this is allowed. I agree, its last "prediction" in the other threat is just a joke. I don't know if he is just troll-joking or just trolling. Or something worse. But he should stop. Im OK with faux 4K (checkerboard rendering, etc) on my HDTV.... its a whole different story on my gaming PC where I'm sitting 2 feet from the screen. PS4 Pro however needs more ooph for '4K' at 60+ fps. People are leaving this place in droves because of thelastword's posts? Are you sure it's not today's horoscope in the local paper suggesting internet forums are the leading cause of syphilis in young people? Millennials are big on that kind of stuff. All seriousness, the mod team is keeping tabs on things here and I'll take a personal look as well to see if any shenanigans are going on or misinformation deliberately being spread, but the poster doesn't seem to be attacking anyone or bombarding the thread and doesn't fit the profile of an astroturfer or w/e. At a glance there are more comments complaining about the user than posts from the user. We have an ignore list, too, you know, if someone rubs you the wrong way. It'll be looked into further, but in the mean time, @thelastword please just keep your commentary to one or two posts and support your positions where appropriate, and @ everyone else, please refrain from piling on needlessly, which does much more harm to the discussion. Subsequent responses in this thread relating to these concerns will be deleted. Thanks. I really don't know... He specificaly said "across the board". The XOX has been having very good results but it is not still on "4k across the board level". I hope the ps5 is 10tf level at least, but im expecting below that around 8-9. This whole argument is how long is a piece of string. Lets deconstruct this..
Mark Cerry - smart guy but designed a box better than the xbox one but not as good as the xbox one x. Works for Sony, represents them for publicity. The fact he said it is irrelevant to the argument really. 4k gaming, depends on the title nvidia titan cant run witcher 2 at 4k60 but can run amost every other game at that. Lets specifiy 4k on games for current gen non pro consoles (since this is what most people agree). Lets also clarify that we dont mean badly optimised games or games where graphics dont push the GPU. A good example might be Star Wars battlefront 2 or Wolf 2.. graphics look great, pushes GPU often has frame rate limited by GPU. Both of these games run about 1080p 60 fps on original consoles and about 4k 60 fps ( with same settings as original consoles or better ) on xbox one x. 6tf with new specific optimisations xbox one x has .. is enough for 4k gaming. If there was no new xbox one x optimisations other then tf then it would prob require 8tf. Mark is correct that 8tf with no other optimisations would be required for 4k current gen console gaming.. or u could use 6tf with other gpu and cpu optimisations such as the xbox one x has. There is no doubt that the xbox is delivering games from 1080p to true 4k on same settings with 6tf. But SantiagoSangiago gameplay is from demo version without optimised drivers from Nv, so we need to look at retail version. 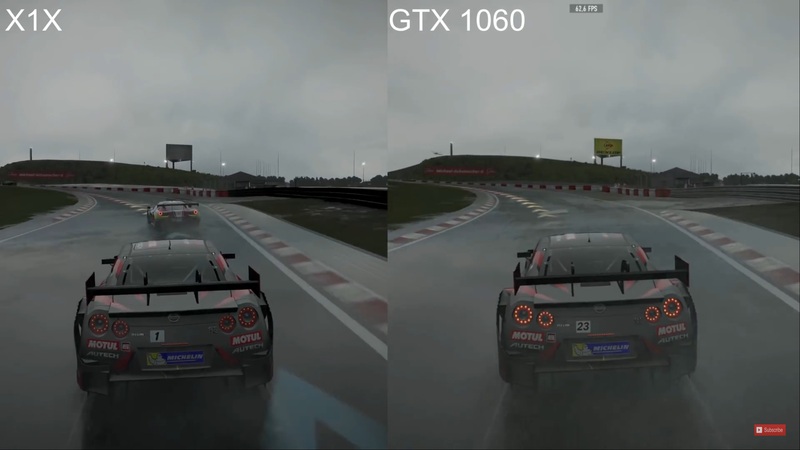 I dont know if his GTX 1060 is OCed or not (probably is), but framerate still dips below 60fps even with few cars on the screen. That guy driving was clean, but if he would drive like MaDz fps should dip even more. MaDz was constantly crashing into oponnents, and he had many cars in front of him for entire race (with rain on top of that). That's why MaDz gameplay is so appealing to me, because I can see how GTX 1060 runs that game in the worst possible scenario. Not surprising, and keep in mind xbox X version is more detailed than PC version (better shadows, ambient occlusion, better textures, more smoke effects, reworked small details). I'm not defending xbox X as some xbox fans, and what's funny many people here on neogaf even think I'm xbox hater (that console has many problems and I like to talk about issues ), but I can look at facts (benchmarks, technical specifiations). It would be strange if RX 580 on steroids (+some vega features + dx12 features build into a chip, plus console games get optimisation that PC cant get) would be only as fast as standard RX 580 (or slower ). If you look at PS4P vs Xbox X GPU, the tflops difference isnt that huge, PS4P is also based on polaris architecture yet performance difference is huge (xbox X can render up to 2.2x as many pixels). Xbox X GPU is totally custom made, and at this point is much faster than standard polaris GPU, and cant be compared to any equivalent PC part. Yet people compare xbox X GPU to PC parts like if it would be the same hardware. Even if xbox X GPU would be use eaxactly RX 580, even then performance on that console will be faster, because consoles always get optimisation, that PC simply cant get. You want to ban him, but for what reason? Because he dont agree with something? He simply have different view, and different opinions, that's all. Few day ago I didint know who that guy is, but I have read few thelastword posts since then, and I have noticed his posts are very well writen and he doesnt attack anyone. They are not well written. Just earlier he states Besides, this game is not locked on either the XBOX ONE or XBONEX at this point.....drops to 50fps on XBONEX and 58fps on XBOX-ONE . This is all to highlight the imperfections to the nth degree when in reality the game drops there in one instance throughout the entire game. . Meanwhile in Digital Foundry's video they say there is barely a hiccup and runs completely smoothly on console and simply fantastic. Even the crashes they are locked at 60fps. The lastword has a history of always wanted to promote any issues no matter how small they are on the Xbox One X while always wanting to give the PC and PS4 the benefit of the doubt. His bias is annoying by design. So it's easy to see he has a beef with the Xbox/Microsoft for whatever reason. Mark Cerny's comment about 8TF isn't accurate either. You will always have some games that are simply too demanding. Even the GTX 1080ti can't do every game in 4K with the highest settings or run every game at a smooth 60fps. Every generation on consoles we get games that have trouble running smoothly and the PS5 will not mandate games at 60fps either. We might even still see dynamic resolutions instead of native 4K. Yes, that we will. And it totally make sense, just because of the current mid-gen refreshes. If we have more dynamic res games, a refreshed console has advantages from day one without the need of a patch (well if it is really dynamic and not some sort of predefined "dynamic" resolution). Maybe we even see dynamic 8k with the next gen, just because some scenes are not as demanding as others and on screenshots it can be sold to customers. I live in US or India. Is he saying ps5 will only be 8tf? I was hoping it would be 10+ tf. Welcome for u to go ahead an test the titles below on your 1060 at 4k at xbox one settings of high or ultra and report your results. Please be respectful to other members, even ones you don't agree with, and posting commentary about other posters only serves to derail the thread. If you feel a member has broken the TOS, please use the reporting tool. Thanks. It is pointless. Even the Xbox One S version in that video looks better than the Original PC version. Not surprising, and keep in mind xbox X version is more detailed than PC version (better shadows, ambient occlusion, better textures, more smoke effects, reworked small details). Please read the title of the video, Remaster vs Original PC version. He even says it in his video that if he had made that video before January 21st the game would've had more bugs on the PC. Word on the street is the dev kits have it at 11tf. MaDz video (that one with the biggest dips) was recorded 9 december, and he was using optimised Nv drivers for that game. Because new Nv drivers were so much better, ComputerBase has included updated results, so in their benchmark chart GTX 1060 no longer dips at 41 fps, it only dips at 49 fps with optimsed drivers . MaDz video shows 60 fps on average with 46 fps dips (comparable results), and that's with high settings. What's funny MaDz have even admitted his GTX 1060 cant match xbox X results in that game (I like his YT video channel, because he is honest person). My PC can indeed easily run forza 7 at 4K (even with MSAAx8), but GTX 1060 is a little bit slower for locked 60fps, min. fps would have to be 15 fps higher to match xbox X results. 450$? So basically he is using OLD AND USED parts prices, and probably even stollen windows 10 key for 10$ (legit key is 100$ alone) and he compared that to NEW xbox X (with warranty and everything new). I'm not xbox fan (xbox fans on this site even say I'm xbox hater ), but this is the most dishonest xbox X vs PC comparison video I have ever seen, and with current prices, even GTX 1060 is sometimes as expensive as xbox X (I have seen prices like that in my country). One other consideration, though I'm not sure most people care, but I would be curious about the power consumption comparisons as well. I'm trying to show you the dynamic settings that happens on XBONEX at times, detail is dynamically lowered or altered based on what's happening on screen or load, hence why you will get slightly pushed back detail or lower car lods on top of the worse MB and lighting.... Jerm is not the only one to have pointed lower lod cars btw......In your video, I noticed this....as an example...the sign, it happens with other details as well with dynamic settings to keep the framerate locked.....Not questioning that framerate should be prioritized, just showing some of the mis-matches.. that exist.....and explain why you would see some dips on the Gtx 1060 in comparison. U use 1 frame from a game with a locked frame rate to do a performance comparison .. what a joke try responding to the benchmarks and my posts rather than pretending they dont exist. You know you forgot to put in your 30 fps mirrors. I'd just like to drop a reminder that disagreeing with someone does not mean they have broken the TOS. Thinking someone has a bad opinion or an alien perspective of a topic, or is unreceptive to your own position is not a reason to report a post. Moderators are not here to win an argument for you by taking out your opponent, who you are free to just ignore. If you believe someone is a troll, then spending many posts feeding them is surely unwise at best, complicit in derailing at worst. If you cannot come to any kind of agreement on an issue, find some common ground or don't and move on. MaDz video shows High settings, not ULTRA. At this point xbox X version settings should be comparable, if not higher. The same with wolfenstein 2, I have purposely linked videos with low/med settings, because I know most xbox X games arnt maxed out, but even with setting at low/med GTX 1060 still have performance problems compared to xbox X at 4K dynamic (and at 4K native it's even worse 35-45fps), so it shows xbox X GPU is more capable than people are willing to admit. And the thing is, RX 580 isnt that much faster in that game (1-4 fps faster at 4K according to gamegpu benchmark results). Results speak for themselves and I can see what it takes to match xbox X results on PC. CPU is not that problematic, even ancient i3 is more than enough to match xbox X results, but in order to match xbox X gpu, stock GTX 1070 is required, at least in gears of war 4, dishonored 2, rise of the tomb raider and Forza 7 (GTX 1070 also dips below 60fps in forza 7, but very rarely, and we know xbox is not using ultra settings, so with tweaks 1070 should run that game at locked 60fps with MSAAx2). When it comes to wolfenstein 2 I'm not so sure if even stock GTX 1070 can provide xbox X experience in that particular game. GTX 1070 and still even with settings turned down and resolution scale to 80% game dips below 60fps more than xbox X version. War Thunder developer suggest xbox X GPU is even faster than GTX 1070, and in this particular game we can indeed see results that support claims like that. That looks like a loading issue, not LOD, TLW, and I think you know that. The words on the sign are completely missing, not lower in detail. It seems a lot of your examples are extremely disingenuous and get called out for being so quite often. Ah so just to get this clear .. you are totally allowing trolling and derailing of thread, you intend to do nothing. Youve had several complaints made about off topic derailing and troll / spam posting and you say to move on to another thread were the same person does the same thing. My GTX 1080ti doesn't do 4k @ 60fps on some AAA games (on ultra preset). I get in the high 40s-mid 50s with the 1080ti paired with a i7-7700k @ 4.5ghz on Assassin's Creed: Origins for example. I get damn near 200 in places on Wolfenstein on 4k/Uber settings. It depends on the game and it's relative complexity, both graphically and computationally. Assuming next gen is Ryzen/Vega tech it will be hard to achieve this on AAA open world games (although custom API and dynamic horizontal res/checkerboarding/other visual trickery etc will help). 8 tflops will be fine for 4k native output but the locked 60fps holy grail will depend on the performance of the TBD custom APUs vs the cpu dependent aspects of gaming. Some games will run 4k/60 easily, some will be unlocked and hit 60 sometimes, many open world games will look gorgeous but likely still locked at 30fps with a Native 4k image-perhaps dynamic depending on the complexity of the application. In the end, even this gen we could have a lot more 60fps games WITH higher resolutions than FHD on the mid gen refreshes (1440p or 4k dynamic/checkerboarded). The meager Tegra X1 the switch uses circa 2015 has a good number of 60fps games that look great but have dynamic scaling etc in games like Super Mario Odyssey but most importantly amazing art direction that overcomes the technical limitations of the platform. Bottom line is most publishers still focus on image quality/resolution over frame rate. That's not at all what was said. Just because somebody may have an opposing opinion to yourself doesn't mean that they're trolling, it just means that they have a different opinion to you. There is nothing in the terms of service about people having vastly different opinions, that's the entire point of having a discussion board. Every report that we receive about any post is discussed amongst the team and assessed in relation to the ToS that all members have agreed to and how it would contribute to the forum. The report button is not a voting button to elect the removal of any member from this community that you may have taken a personal dislike to. Some reports may be dealt with quickly because they really are that simple to deal with but sometimes we have reports there for many hours due to the discussion that's taking place in the background on how best to move forward on behalf of the entire forum. All reports are also confidential so you would not really be aware of "several complaints being made" unless they were either complaints that you registered personally or if they were complaints that were registered against you. We certainly wouldn't want to see groups of members getting together and creating an organised complaint campaign for personal reasons against other members. If you disagree with other people's opinions then you have the opportunity to discuss those differences with them in the thread in question. If for some reason you believe that you've reached the point where you feel that you're unable to do that due to their opinions being so far removed from yours then you do have the option to simply ignore that person and just not respond to them. That happens sometimes, it's OK to feel like that and to rise above it. Is that why most XBX games run below 4K? Every report that we receive about anything is discussed amongst the team and assessed in relation to the ToS that all members have agreed to and how it would contribute to the forum. The report button is not a voting button to elect the removal of any member from this community that you may have taken a personal dislike to. Some reports may be dealt with really quickly because they are that simple to deal with but sometimes we have reports there for many hours due to the discussion that's taking place in the background on how best to move forward on behalf of the entire forum. All reports are also confidential so you would not really be aware of "several complaints being made" unless they were either complaints that you registered personally or if they were complaints that were registered against you. We certainly wouldn't want to see groups of members getting together and creating organised complaints campaigns for personal reasons against other members. That happens sometimes, it's OK to feel like that and do that. The response was to either counter his arguments or ignore him. He was also warned to keep his comments to a minimum but it appears as though he gets banned in one topic and ramps up his actions in others, even to the point of bumping threads that were dead. What exactly is the game-plan here if others do counter his arguments and he himself ignores everyone that doesn't jive with his own opinion while he embellishes everything? Of course we like different opinions, but when one's opinion is always cynical and biased towards one platform the discussion is over before it even starts. I realize the moderators can't read every thread or be bothered to look into post history but it is pretty evident if you did he's here to troll and downplay anything to do with the Xbox One X. 2016, it really shows you know nothing about PC building. If a post is reported that has not broken any rules, then it will be rejected. If a member keeps doing this as some kind of vendetta or because they do not like someones view, then I will treat it as it is, a deliberate waste of moderators time and harassment of another member of this forum. This is the fourth comment on this page from admin or moderators, and you have been told this has been looked at. Your suggestion that moderators can't be bothered to look at post history couldn't be more wrong, we just do not share your opinion of the situation having done so. I am not going to keep going back and forth on this. If you are incapable as a person of not addressing a post you disagree with, then block the member and you will never see their posts again. If you are incapable of doing either, then you are at fault. To be absolutely clear, moderation here is not a debate between members, nor is it something we need to provide you a gameplan for because you disagree with actions taken. It is handled by a dedicated team who review, discuss and determine an outcome for each situation. Posts, history and agenda are and have been taken into account and the team do not agree with your perspective. Continued pursuit of report spamming for posts that have broken no rules will not be looked upon kindly, nor will derailing this thread further on this matter. 8tf is not needed for 4k gaming. But for gaming at "4k across the board" this gen, like Cerny said, it is true. Yes, the xox is more powerful than the pro, but it doesnt have 4k across the board. Both ps4pro and xox are cheaply made consoles, neither sony nor microsoft are doing any real effort in pushing specs forward. Forza 7 is a very well developed 4k60 game that disguises its tricks and shortcomings quite well, but then what about pcars 2 and its much more detailed simulation. Agreed. We are waaaaaaay past the point where "hardware specs" mean anything in videogames. Software developers can create anything they can imagine, and it will look spectacular. If modern games are not running at 60 fps, it's only because those developers made the decision not to do so. Heck, I have Saturn and Dreamcast games that play at 60 fps, and the Playstation 4/Xbox One/Switch must easily be a million times more powerful. Yeah, good point. If developers target 60fps, especially from the get-go, it can be achieved. They may have to sacrifice specific things to make it happen, but it's all about what they want to do and what they feel is important or not. I'd hate video games if all devs target 60 fps. It's not needed for all games.